The Period of PURPLE Crying is a new way to help parents understand this time in their baby's life, which is a normal part of every infant's development. It is confusing and concerning to be told your baby "has colic" because it sounds like it is an illness or a condition that is abnormal. When the baby is given medication to treat symptoms of colic, it reinforces the idea that there is something wrong with the baby, when in fact, the baby is going through a very normal developmental phase. That is why we prefer to refer to this time as the Period of PURPLE Crying. This is not because the baby turns purple while crying. The acronym is a meaningful and memorable way to describe what parents and their babies are going through. Scientists decided to look at different animal species to see if they go through this developmental stage. in the first months of life as human babies do. When these babies are going through this period they seem to resist soothing. Nothing helps. Even though certain soothing methods may help when they are simply fussy or crying, bouts of inconsolable crying are different. Nothing seems to soothe them. During this phase of a baby's life they can cry for hours and still be healthy and normal. Parents often think there must be something wrong or they would not be crying like this. However, even after a check-up from the doctor which shows the baby is healthy they still go home and cry for hours, night after night. "It was so discouraging," said one dad. "Our baby giggles and seems fine during the day and almost like clockwork, he starts crying around 6 pm. He is growing and healthy, so why does he cry like this?" Often parents say their baby looks like he or she is in pain. They think they must be, or why would they cry so much. Babies who are going through this period can act like they are in pain even when they are not. In my own case, I know my son was not sick. He was in the top percentile for growth, he giggled and was happy other times Then he would start to cry, and cry, and cry. The doctor kept telling me he is just fine. After learning all of this, we decided we needed to share this information with other parents. We had to take this information and put it into a statement that told the story about this phase in a baby's life. Dr. Ronald Barr, a developmental pediatrician who has likely done more studies on infant crying than anyone in the world, came up with the phrase the Period of PURPLE Crying. His idea was to explain this phase to parents of new babies so they would know it was normal and they would be encouraged that it would come to an end. The acronym PURPLE is used to describe specific characteristics of an infant's crying during this phase and let parents and caregivers know that what they are experiencing is indeed normal and, although frustrating, is simply a phase in their child's development that will pass. The word Period is important because it tells parents that it is only temporary and will come to an end. Parents, after learning about Period of PURPLE Crying have said, "Finally they have called it something that describes what we are going through. This word colic was hard to get a handle on." 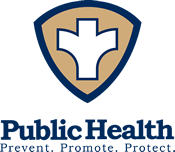 The New Madrid County Health Department strives to promote health and reduce risk by preventing disease and illness and protecting life and the environment.